This is the twenty fourth post of our series of projects to make us thankful for DIY. Be sure to check back everyday during the month of November for new simple and easy DIY projects. What is served in your home during Thanksgiving? Is it Ham, Turkey, or maybe something else? Here in our home, we serve turkey during the Thanksgiving holiday. Our preferred method is to roast our turkey in a roaster pan, and then later we've got the pan drippings so we can make home made turkey gravy. Yes, we do use the giblets too! In past years we've used the disposable roaster pans and thrown them out after the meal has been cooked. and she is really thankful for that. It can be challenging to roast a large turkey when your oven size is on the modest side. We do get creative during cook time. Both oven racks are in use and everything is squeezed in very tightly. Trying to manage cooking several dishes in an oven that still has a large turkey in it can be a feat. If you're switching over from the traditional roast method and going with deep frying this year, you'll have to do some advance planning to ensure you've got all the supplies you're going to need. 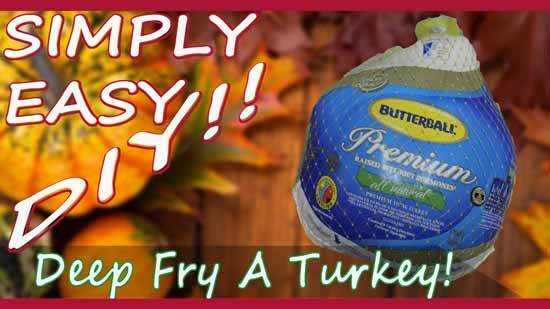 The "Art of Maniless" YouTube channel goes over all the equipment you'll need and also the safety precautions that you can take to ensure your delicious turkey frying success this year! Chef Karl goes through detailed instructions on the deep fry process. An excellent safety tip he suggests is to invest in the right safety gloves. We've already got these welding gloves that should work nicely. I hope you enjoyed today's featured project and don't forget to stop by "Art of Manliness" YouTube channel to check out even more great instructional and entertainment videos from Brett. Don't forget to subscribe and check out his website.